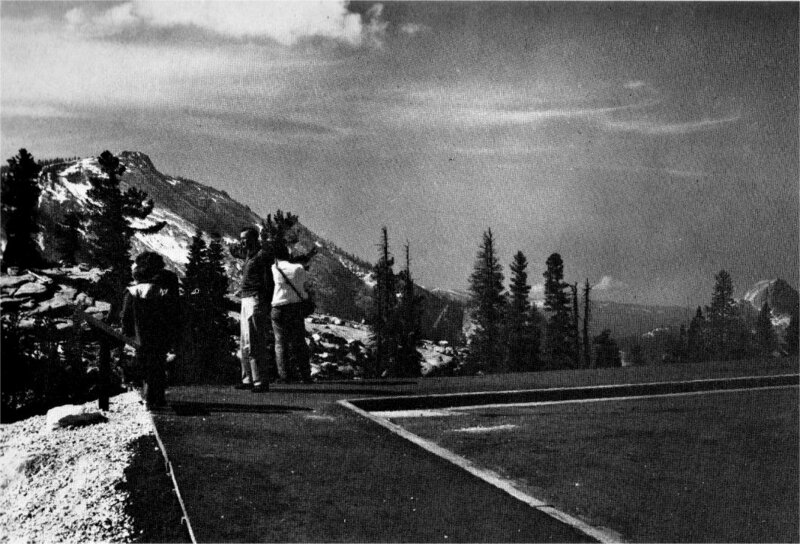 Following World War II, travel to the parks resumed its upward trend and by 1950 use of the Tioga Road had increased more than 30 per cent above the pre-war level. Correspondence increased, too, both favoring and condemning the middle 21 miles of the Tioga route. While some feared damage to the park’s scenic values would result if the route agreed upon in 1935 was built, many more feared the old road itself and worried about the more personal damage to themselves or their cars while negotiating the “horse-drawn” alignment of the remaining section of the Great Sierra Wagon Road. The latter point of view became dominant as the travel picture changed. Larger cars and increased use of house and camping trailers made the old road a nightmare for many drivers and passengers alike. The American Automobile Association warned, “It is not unusual to find people . . . unused to mountain roads, who just go to pieces, freeze at the wheel and park their cars in the middle of the road to wait for the Park Rangers or a kindly motorist to drive their cars the rest of the way.” (115) And such was the none too happy picture on many a crowded summer day. If the Tioga Road was to adequately serve the public it needed immediate improvement. Although the routing had been long approved, World War II delayed action and considerable discussion was to ensue before construction began. During the late 1940’s and early ’50’s, a series of alternate routes were suggested by individuals and conservation groups. One plan, the “high-line” route via Ten Lakes and the northeastern slopes of Mt. Hoffmann was proposed by Superintendent Thomson. The Park Service again sought the advice of foremost experts in the field. William E. Colby, an esteemed San Francisco lawyer, noted conservationist and Sierra Club officer, in concert with fellow Yosemite Advisory Board members J. P. Buwalda and Duncan McDuffie replied, “This is a subject to which the Yosemite Advisory Board has given very careful consideration over a long period of years. The proposal to route the road north of Polly Dome is, in our opinion, a grave mistake, because it would intrude a road into an area that is now and will remain wilderness in character if the road is not built.” The Board endorsed the Park Service’s original plan throughout. Accordingly, it was determined that the 21 mile central section of the Tioga Road would follow the route as proposed by the Service and as strongly endorsed by the Yosemite Advisory Board. There remained, however, the question of standards what would be the most appropriate construction standards for the new central section and who would be the best qualified person to undertake this study? Director Wirth was able to secure the services of the country’s most outstanding authority in this field in the person of Walter L. Huber. Mr. Huber was not only a noted consulting engineer and past president of the American Society of Civil Engineers, but a nationally recognized authority in the field of conservation. He was a former president of the Sierra Club and present chairman of the National Parks Advisory Board. Mr. Huber had often been called to advise State and Federal agencies contemplating construction where esthetic considerations were important. The full 21 mile central section was completed and officially opened to the public on June 24, 1961. The cost was $5,491,000. The cost of the western and eastern sections was $1,450,000, or a total cost of $6,941,000 for the 46 miles from Crane Flat to Tioga Pass.